At Smith Family Dentistry, we aim to help all those in and around Hurricane and Charleston, WV attain beautiful smiles. Unfortunately, there are some people with severely decayed, damaged, or even missing teeth who may believe that they’ll never be able to regain the smile that they once had. However, we’re proud to say that we’re able to prove them wrong! With the usage of our dental implants, we’re capable of restoring a patient’s beautiful smile. 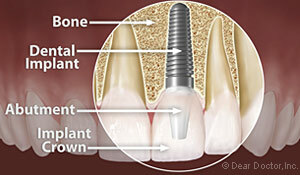 Dental implants are small, screw-shaped titanium posts that serve as the replacements for the roots of a missing tooth. The surgical procedure performed to insert the implant into the jawbone is quite minor and routine, requiring only local anesthesia in most instances. After the implant properly fuses to the jawbone, the implant will be topped with a lifelike crown that’s custom-made to match the existing natural teeth. 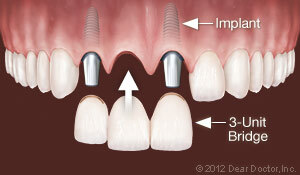 Dental implants have a success rate of 95 percent, which is significantly higher than other tooth-replacement options. With proper care, a dental implant can last a lifetime. Replace Multiple Teeth — Implants can be ideal for replacing multiple teeth just as they are for single teeth. You won’t even need to have a separate implant for each tooth either; an implant tooth can act as a support for fixed bridgework. For example, if you happen to be missing three teeth in a row, we can place an implant on each side of the gap with a crown in between. 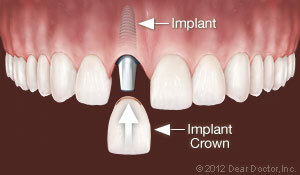 This crown will require no implant underneath as it will be supported by the implants on each side of it. As an added bonus, none of the natural teeth will need to be used as bridge supports either. This will prevent weakening of the teeth and keep them from becoming more susceptible to decay. Replace All Teeth Permanently —Dental implants are also able to support an entire arch of teeth (either your upper or lower arch). The entire arch can be supported by four dental implants, though in cases where jawbone density and volume have deteriorated, six may be needed. 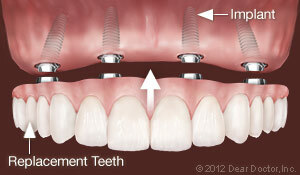 These dental implant replacement teeth will protect the jawbone, they won’t slip. 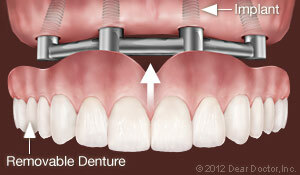 Support Removable Dentures — Dental implants can also make dentures more comfortable as well. Dentures traditionally rest on the gums, which puts plenty of pressure on the underlying bone. This will then accelerate bone loss and cause the jaw to shrink. Because of this, the dentures can slip, especially those on the bottom. By attaching a removable denture onto implants, the pressure will then be placed in the bone structure and not on the bone surface. This will help preserve the bone and also keep the dentures from slipping when eating or speaking. 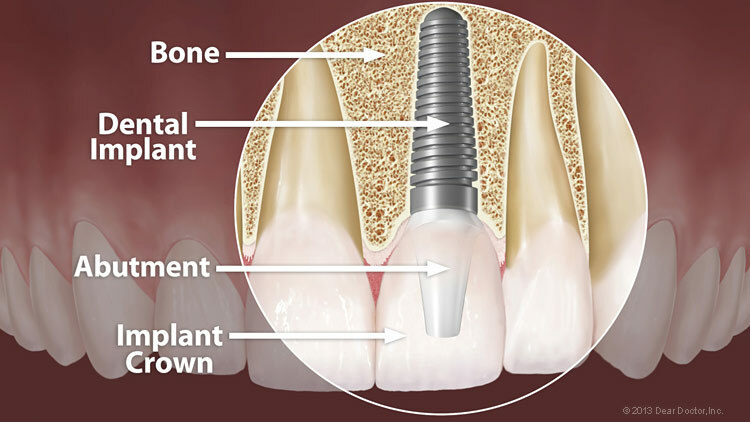 There are really only two main ways that an implant can lose attachment to the bone and fail after it has successfully fused. These ways are poor oral hygiene and excessive force when biting. Poor oral hygiene or a lack of regular cleaning can lead to a bacterial infection known as peri-implantitis. By flossing and brushing your teeth on a daily basis, you can prevent this from happening. Excessive biting forces can occur from a habit of grinding or clenching your teeth. If you happen to do this, we’ll recommend a nightguard to you so that you can protect your implants. After all, dental implants are a long-term investment toward your smile, your health, and your well-being. Make sure to protect that investment. If you’re interested in dental implants or you’re even just looking for a children’s dentist, we encourage you to give us a call at (304) 343-9131. Alternatively, you can fill out our online appointment request form. Please don’t hesitate to contact us if you have any questions, comments, or concerns. We look forward to hearing from you and helping you attain a beautiful smile!